Access to Pool and Tennis in the summer and Hot Tub, Sauna and Clubhouse year round. This beautiful condo is completely remodeled with exceptional quality and is well appointed. The entry level offers the kitchen with lovely cherry wood cabinets, granite counter tops and high-end appliances. It is well equipped, has a small dining table and is partially open to the living area via a large pass through which creates a more spacious feel. 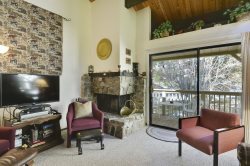 The living room is furnished with a comfortable chair and sofa that is a queen size sleeper, a wood burning fireplace, flat screen TV and access to the deck with gas BBQ and outdoor seating. The floors are beautiful hardwood throughout, the mattresses are high-quality as are the linens. In addition, there is a bedroom on this level with Bunk bed (Single+ Single) and a Single bed (this bed is very soft, per the Owner) and a half bath. Upstairs is the master loft with queen size bed and full bath with tub and shower. This unit has wifi access. There is NO air conditioning. The Dollar Hill II Complex offers a pool, hot tub, sauna, 2 tennis courts, and game room. The swimming pool is open in the summer only. This property is central to all of North Lake Tahoe. The bike trail is just across the street from the complex and continues through Tahoe City to the West Shore or Squaw and Truckee. About 1.5 miles to Tahoe City featuring plenty of activities, restaurants, and shopping. With a location close to the Nordic Center, there is plenty of mountain biking and hiking with a nice network of trails. The nearest public beaches - Skylandia and Bristlecone - are great places to enjoy the water and only a short drive, or a modest walk, away! This unit does reside close to the highway, most guests tend to agree the noise is very subtle and hardly noticeable, but during our busy times the noise from cars may be more pronounced. PLEASE NOTE - THIS UNIT HAS 2 PARKING SPACES. There is no additional parking available. This place was really nice and in a great location. The space was really comfortable and was stocked well with necessities. The hot tub and pool were a nice addition as well! We'd definitely stay there again! Great location and value! Such a great town to explore. Very clean and close to everything you need. This is a cozy condo in a great location, that provides a wonderful value. Great for a group of people who do not mind being in close quarters with one another. There is only one shower, so if you want lots of privacy, you might want to look elsewhere. Also, the stairs to the master bedroom are steep, so if you have limited mobility, the stairs might be a problem. If you want a clean place near trails, hiking, and downtown Tahoe City for a reasonable price, this is a wonderful option. My family had a wonderful stay. Our stay at this beautiful property was absolutely wonderful. Had no issues whatsoever and thoroughly enjoyed my time there. Very close to town and literally minutes away from the lake. 10/10 would stay again and recommend to friends.